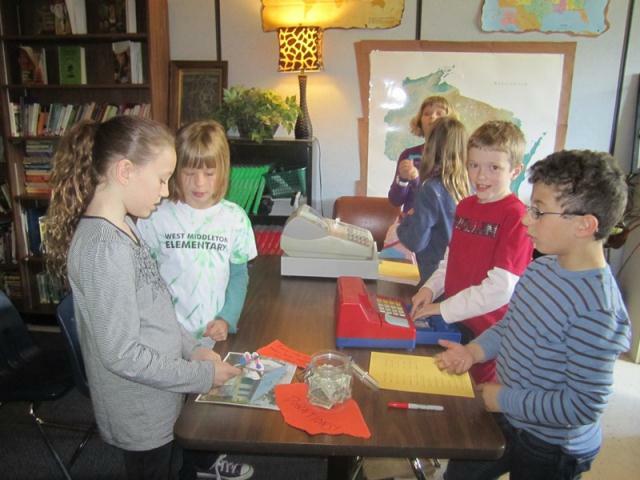 The third-graders at West Middleton held a market from April 10-13 to raise money for School for Andy - a solar powered school built by Meaningful Volunteer in Uganda. Among the items they sold were bookmarks, painted fans and jewelry. They raised a little more than $1,700. 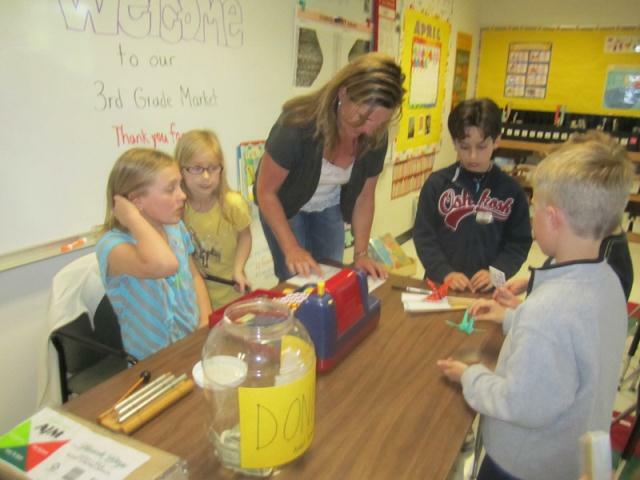 All three third-grade teachers, Sammy Newburg, Diane Boles and Beth Marty, along with student teacher Nikki Clinger collaborated on the project. The project tied in nicely with the district’s new social studies curriculum, which included a unit on the economy, Newburg said. 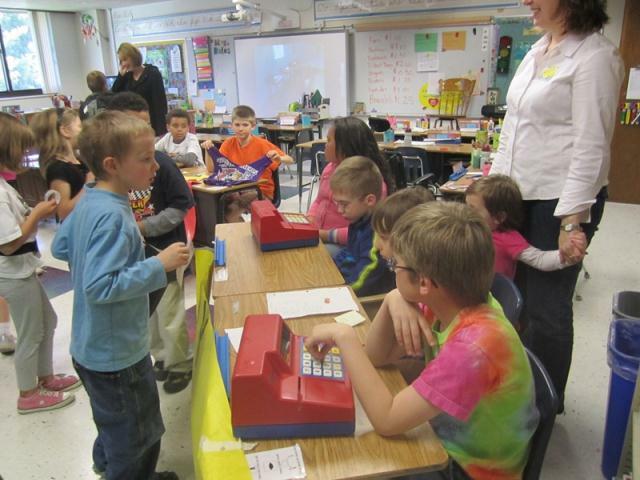 The students looked at different kinds of markets, products, producers, consumers and profit. They advertised by posting signs throughout the school and reading ads on the morning announcements. They also handled the cash registers. Other classes signed up in advance or came in during free times. The third-graders didn’t just benefit in social studies. 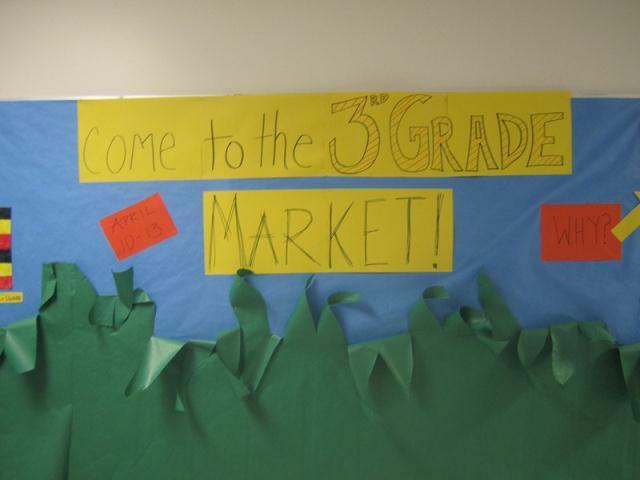 The market project also provided language arts and math lessons. The students made the products just before spring break. They also priced the products. Tables were stocked with items throughout the week, although by Friday afternoon many of the tables were bare. “Now it’s everything must go,’’ Newburg said. All of the profits will go to the School for Andy, a solar-powered school in Buyaya, Uganda. The school was built as a memorial to Andy Manley, who died in a Sun Prairie house explosion in 2010. Manley was in Newburg’s teaching cohort at the University of Wisconsin-Madison. “It feels great to do something for him,’’ Newburg said. Newburg also thinks there is real value in students from the West Middleton community reaching out to those in need. “It’s good for our students to learn what it really means to help others,’’ she said. Newburg, Boles and Marty hope to make the market project a tradition.